Tecra Tools has assembled this Metric 1,000 volt rated insulated tool kit to protect people, property and productivity. Double insulation provides a visual cue for tool failure. If the yellow shows through don’t use the tool near voltage! When looking for the best engineers tool kits, try our Metric insulated tool kit comes neatly packaged in a rugged, waterproof plastic case with custom tool control foam interior to protect your investment. 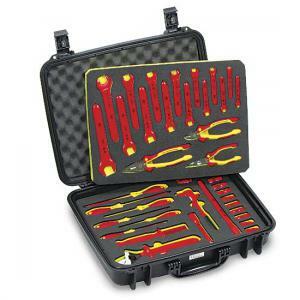 This 40-piece 1,000 volt rated insulated safety tool kit features a full set of open end wrenches, a complete 3/8" drive socket set, ratchet handle and a insulated knife. The kit also contains a full set of screwdrivers and a selection of the most commonly used pliers and cutters. Lifetime warranty on mechanical parts and a one-year guarantee on insulation. NOTE: The Insulated Tools included in this tool kit meet or exceed the following specifications: ASTM F-1505-01,EN/IEC 60900-2004, VDE 0682/part 201, ISO 9001, Conform To NFPA70E & CSA-Z462 and OSHA's Test and Safety Requirements. 2 Extensions , 5" & 10"